Spinal cord schematic diagram with all sections - cervical spine, thoracic spine, lumber spine, sacrum, coccyx. And diagram of vertebra. Understanding what the spine is comprised of can really help you understand what is going on with your back pain. In my 25 + years of treating and managing people with back pain or chronic pain, I have learnt they know what the issue is – as in they have been given a diagnosis – or they know they have poor posture…but what they don’t know is what impact that can have and what the different things mean. This video is a little long – as I love to teach…. but it’s 24 mins of what the spine is comprised off and what happens when you have a disc issue or a facet joint issue – what’s going on and what can make it worse or better. Do you know how your back and spine move, what the different structures are for, and what they do? 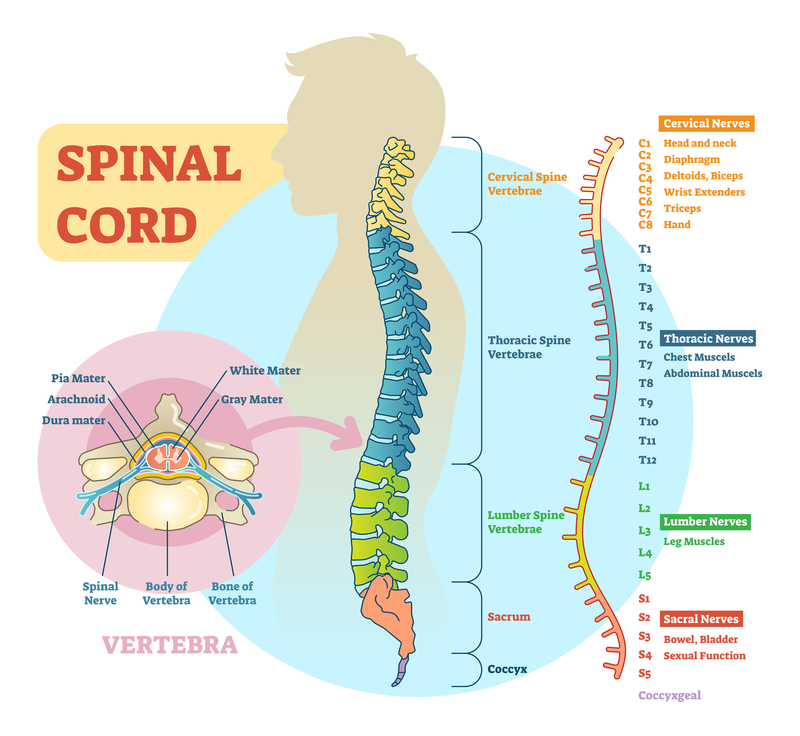 The spinal column is made up of 7 cervical, 12 thoracic and 5 lumbar vertebrae bones, which are joined together via facet joints – the bottom of the top – to the top the lower. Those joints form a small hole where the nerve of the spine pass through. The bones are rigid, so the discs form a cushion between each bone and allow for easy movement along with the joints. The big body of the bones protect the spinal cord that sits deep behind it, and from which the nerves pass out through the openings between each vertebrae. Anything that causes a disruption or change in alignment to this can cause pain. The discs, ligaments and joints, as well as the nerves and muscles that cover everything are all pain sensitive. Just because your MRI shows a discs issue doesn’t mean that it is the disc causing your pain… that’s why its so important for us to look at the ‘clinical picture’ which means does what you complain of match what we test and does that match what your MRI says. We see so many that have the x-ray of a 20 year old and nothing to see who are in heaps of pain, and people with the x-ray of a 90 year old who are pain free. The clinical picture and what you complain of has to be addressed – and the root cause of what is going on and where the pain is coming from has to be found – this is why if you have an injection into the facet joint and it doesn’t work – it points to that facet joint not being the cause of your pain. Hence why a good thorough assessment should provide the answers to your pain problem area, whatever your test results say – and sometimes that doesn’t quite correlate fully. We do full hour assessments so we can get the full picture. How and why does Pilates work? Always wanted to try Pilates or Barre but been too worried to try? !